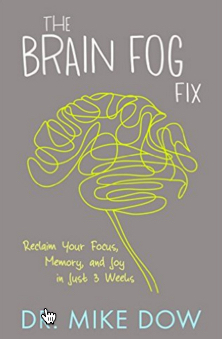 The title of Mike Dow’s book The Brain Fog Fix leapt out at me, and I was eager to read it for two reasons: I am always interested in general in the topic of behavior being influenced by nutrition (which I suspected was the core of the “fix”) and I happen to have a grandson who complains of suffering from “brain fog,” and I hoped we might be able to provide some (admittedly unsolicited) suggestions that might help him. If you search for Mike Dow online, you will instantly notice the many pop culture links (Dr. Oz, TLC’s Freaky eaters, others) that might make you suspect this is just another media doc out for a quick buck…and admittedly, he is a doctor the same way Dr. Laura is a doctor: a therapist. But his advice is sound, and there is quite a bit of science to back up the opinions. And, let’s face it, I am a sucker for books that state the case for cleaning up your diet to heal your brain before you flood it with chemicals. In addition to the nutrition, he advocates cognitive behavioral therapy, and seems to be interested in helping people as well as making a buck! It may often be a case of him preaching to the choir, as I am not sure how receptive people are to what can be a drastic change in lifestyle, and I suspect some people have to be REALLY desperate to try his suggestions…but it made sense to me. It isn’t a scientific text, and it is pop culture, but there isn’t anything in the advice that could hurt and, as they say, it might help! I appreciate having the opportunity to read and review this book in exchange for my unbiased review. Five stars! In 1996 I remember reading A Civil Action, about a town in Massachusetts where people fought back against environment pollution. That book freaked me out, and made me conscious of the cavalier way our water supply can so easily be placed at risk by greedy corporations. 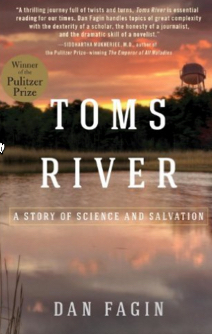 When I heard about Dan Fagin’s book Toms River: A Story of Science and Salvation winning the Pulitzer prize with a story about a New Jersey town that was ravaged by astronomical rates of childhood cancer, I was immediately predisposed to LOVE the book, and I was not disappointed. The book is filled with heart-wrenching personal stories of people whose lives were affected (and often destroyed as a result of the actions of giant chemical companies just dumping unbelievable amounts of toxic waste right into to water supply. I loved the way Fagin told the history of the companies involved, going back to the origins of dye-making. The companies had basically trashed the environment in Basel, and then moved to Cincinnati, where they got into some trouble for their environmental practices (or lack of them). When these giant companies came to town looking to start up operations, all people could see (or cared to see) were the jobs that would come along. This was one of the biggest dye manufacturing plants in the entire world, and they went on into plastics and other chemical products. What really knocked me out was the QUANTITY of waste the factories produced…in fact, they produced more waste than product! So they had to put it somewhere, and the story of illegal dumping is a big part of the Toms River saga. People would dump thousands of barrels of waste wherever they could, including a chicken farm. Speaking on Democracy Now, Dan Fagin said that even though he worked as an environment reporter for more than 25 years, the brazenness of the behavior of the companies involved in this story surprised him. In addition, he marveled at the way people were able to band together to pursue action against the companies involved. The book is fascinating on several levels: documenting corporate malfeasance, providing a look at the history of chemical production, peeking into the pain suffered by the innocent victims of the illegal dumping, glimpsing the political shenanigans that led to the locating of the plant in the first place, and finally inspiring readers who want to believe that it IS possible to “fight the man” and make corporations at least a tiny bit accountable for the actions. I am grateful for the opportunity to review this book in return for an unbiased review. Totally five stars! Published elsewhere under the title Heat of Betrayal, the novel is set in Morocco, and revolves around Robin, a professional young woman (an accountant by day) and her artist husband Paul, who is a bit of a flake – but hey, he is an artist, right? So she has typically cut him quite a bit of slack as he is the less responsible (by far) in terms of finances and organization…not necessarily a bad thing, but the story quickly unrolls as a thrilling mystery where Robin needs to search for truth. The question becomes, do we ever really want the WHOLE truth? The setting is critical to the story, and the author conveys the heat, the blinding sun, and the crowds in a way that made me FEEL like I was in North Africa (and desperately wanted to get the hell out). The characters were vivid, and none seemed like caricatures, as is often the case for mystery/thrillers set in remote locales. Overall, I just loved this book. 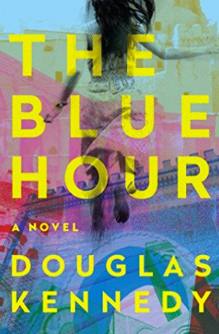 I am on the hunt for other books by Douglas Kennedy, and am very grateful to have had the opportunity to write a review of The Blue Hour in return for an advance copy (although I really think the other title (Heat of Betrayal) is better…just MHO).